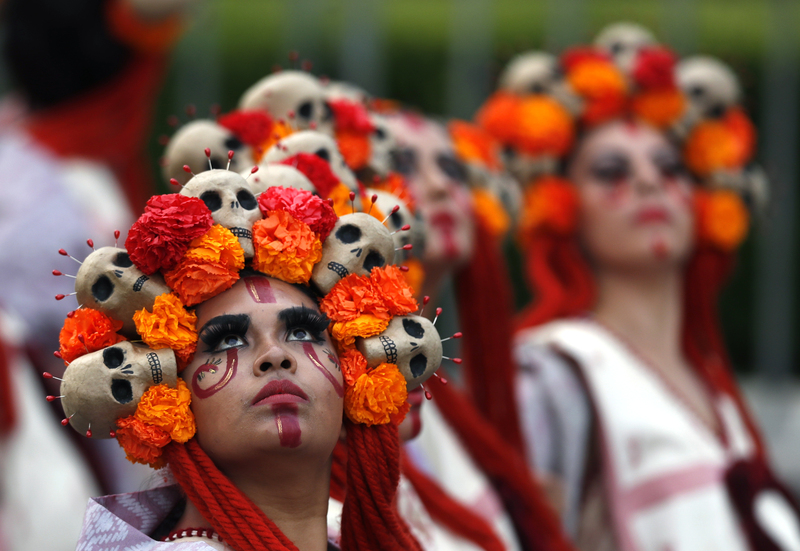 Day of the Dead is not “Mexican Halloween”—it’s a day where death is reclaimed. Last fall we had a house fire. September, October, November—day after day we went through the burned house to see what could be done while the salvage crews sorted our belongings. Suddenly my husband and I owned a houseful of things that were damaged by water and smoke. One pile grew astonishing in magnitude, everything named, numbered, tagged, packed to be cleaned and inventoried as “salvageable” among the pages of a giant white book in a process designed to be practically omniscient. The rest, all “non-salvageable,” was massed together, photographed randomly and trashed at our curb where the restorers parked their abysmal dumpster. It was strange and terrible to see this abundance of possessions in our lives revealed as such a burden. We were safe, we reminded each other; let it all go. At night I talked to God about getting my heart in a pinch over stuff we did not need, but most days I stole away from the dumpster with another of our small valuables: our wedding photographs, my husband’s cologne, a perfectly good broom, the molcajete my mother had given me. These were ordinary sacramentals from the life we had offered one another in marriage. I was ashamed of how little I retrieved, ashamed of wanting to retrieve it. In the end, the sheer waste of things was appalling to me because it felt as though something incarnational was at stake. In speaking of spiritual realities, it is perhaps too often said that material things are pernicious or unimportant, even as matter is all around us, within us—beyond us—shimmering with signs, meaning, intent and design. “We must use or abstain from created things according as they lead us to, or take us away from, God,” writes St. Ignatius Loyola. Matter points beyond itself, toward the secrecy of existence; and if we pay attention to creaturely things in that way, we may transcend ourselves, too. We are materialists, of necessity. We made a simple altar with the nearly discarded photographs of our deceased loved ones. The wrecked parts of the house were gutted. The dumpster, at last filled, was carted away for good. Water and power were shut off so that the builders could make repairs safely while the house was allowed to dry out. That autumn was unusually warm. The leaves had hardly changed color before dropping to the ground, and the yard withered, unwatered for months, though the builders worked overtime to get us back home. A miracle, then, when we moved back in and found in our flower bed a handful of blooming marigolds. We thought of the floating gardens of Xochimilco, the Place of the Flowers, in Mexico City, where marigolds are grown on the chinampas built by the Aztecs and are harvested at this time of year to decorate the graves and altars of the faithful. We brought the blossoms inside. We made a simple altar with the nearly discarded photographs of our deceased loved ones. We thought of Día de los Muertos, Day of the Dead, not long past. We decided to have a feast. The first thing people notice at Día de los Muertos celebrations? The altars. Heavy-laden with ofrendas of bread and fruit and Coca-Cola, flowers and candles and photographs, saints and crucifixes and sugar skulls, the altar almost collapses into itself from the pure extravagance of color and scent. On the feast of All Souls, it is to these altars that the departed ones return, caught almost as if by lures, by the florid colors, the smells and the flavors, of foods they cherished on earth. And mirroring that movement from the afterlife to this life, the family moves from the altar to the grave, where weeds are pulled and headstones are mended—accompanied by more flowers, more food, more music. On this feast, a graveyard—more often a place of decay and of forgetting—can become another home, worthy of the gathering of family and friends, worthy of restoration. And the otherwise terrifying aspects of death and decomposition are reframed in the narrative of Day of the Dead emblems to emphasize the eternal, immaterial life wedded to and hidden in this material world. The corpse becomes living bone—skeletons dancing, singing, drinking, eating—while basic staples such as sugar and bread are shaped into skulls and bones, so that the corpse might be eaten—delightfully, sensuously—and defeated, as it is in the transcendent reality of spirit. On this feast, a graveyard—more often a place of decay and of forgetting—can become another home, worthy of the gathering of family and friends, worthy of restoration. The idea has its parallel in the Catholic ritual of eating the risen body of God, who is present in the Eucharist. Unlike the cult of Santa Muerte, Saint Death, which allegorizes and personifies the idea of death and uses a skeletal iconography that may seem related to the iconography of Día de los Muertos, the dead who are celebrated in Day of the Dead familial gatherings are not abstractions. They are departed loved ones, actual people in actual graves, all of whom are recognized as part of the mystical body of the communion of saints. Debates about the source of Día de los Muertos traditions take predictable turns. As with all histories of the Americas, there is never one version, and the controversies depend on who is telling the story. Some scholarship values the idea of European roots: rosary beads and novenas for the souls in purgatory, Masses for the dead—practices that are specifically Catholic at the source and that resonate with the customs associated with the feast of All Souls. Other scholarship suggests that the role of ancestors in Día de los Muertos celebrations—the idea that the living must attend to the dead so that the dead will protect the living—is more likely to be indigenous in origin than Catholic. Whether by force or by attraction or by a mixture of both, a syncretic culture emerged that in some ways sits at the very heart, symbolically, of Latin American and Latinx identity, which has itself long been destabilized through conquest, commodity and cultural appropriation. To celebrate Día de los Muertos is to live in the ambiguities of these identities, as well as to be buried in unknowing. And these questions, never mere anthropology, come home to me. Who am I, here, in Galesburg, Ill., far from family and home? And what right do I have to celebrate the Day of the Dead as if I were with my family, on the border of Mexico, drinking beer, eating too much food and asking my cousins to play one more song? Here in Galesburg, I do not have a grave to return to, to tend. Even in Del Rio, Tex., where my grandmother is buried, there is no headstone to mark her grave—we could not afford one. Would I still be able to find her grave now? Maybe part of what marks me as Mexican-American is that I have migrated; I am scattered; I have become over time too diffuse to carry tradition forward. But if something of that first, lost indigenous world survived inculturation, assimilation and massacre, and is given to me as my inheritance, might it also establish itself defiantly in rural Illinois, where everywhere in stores, Halloween and the Day of the Dead have become interchangeably, strangely the same? The generic identical skulls on the shelves, brightly painted, beautiful in their way, entice me, too. But perhaps I am lured by what I know they signify, by their far remove from spiritual content, by the way in which I understand bone as a kind of metonym for the soul. Maybe part of what marks me as Mexican-American is that I have migrated; I am scattered; I have become over time too diffuse to carry tradition forward. Admittedly, my husband and I will be first in line when Disney/Pixar releases “Coco” on Nov. 22. The film promises a good story, one that overlays a quintessentially American dream—one boy’s individualist quest for self-realization—onto landscapes and themes associated with the Day of the Dead. I know this is commercial tourism. I know tradition is a language, and that the tourists do not speak the language. But they can learn. A good film, artfully written and made, might do much to illuminate the meaning of the Día de los Muertos tradition. And something else: this tradition is a form of prayer. And prayer carries forward where tradition dies out. In fact, prayer is its very home. My husband, a baker by trade, is learning the language of the feast. The night of our gathering, I watch him knead bread scented with orange blossoms. He shapes the dough into small bones, bones that together make a body, a body that is for me. Then comes a towering chocolate cake topped with candied oranges and chocolate flowers. The smell of cinnamon and hot chocolate and Kahlúa fill our kitchen. We put the food on the altar, on the dining room table, on the kitchen counters—anywhere—so that everywhere people look they will find food. We put a photograph of my grandmother in the center of the altar. She is young. She stands beside her mother. Before the guests arrive, we invite whoever is listening: Come home. Interesting article, by why the pictures of pagan practices in a Catholic Magazine ? Are those skulls used as quasi - head necklace traceable - in tradition - the human sacrifices of the Aztecs ? I have just read and am much moved by this article .I took a journey once to Mexico City to the shrine of Our Lady in memory of my daughter. LaterI travelled through other parts of the country .I have travelled in many countries but my lasting memory in all my encounters was that of the dignity of the people of Mexico in spite of the poverty of so many of the inhabitants . A belief in something beyond self. This article also appeared in print, under the headline "Dia de los Muertos: A Day to Celebrate Life by Reclaiming Death," in the November 27, 2017 issue. Gina Franco is the author of The Keepsake Storm. Her work has appeared in publications like 32 Poems and Image. Her writing is also anthologized in Camino del Sol: Fifteen Years of Latina and Latino Writing, and The Other Latin@: Writing Against a Singular Identity. Christopher Poore is a Regenstein Fellow at the University of Chicago Divinity School and an associate poetry editor at Narrative Magazine. He lives with his wife, the poet Gina Franco, in Galesburg, Ill.